An office floor at Samsung Hub along Church Street has been sold for nearly $39.4 million or $3,000 per square foot based on its strata area of 13,132 sq ft. On psf basis, this marks a fresh high for the building, which is in the Raffles Place area. 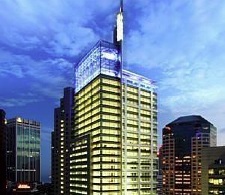 An Asia-based investor is said to be buying the 16th floor of the 30-storey building. BT understands it plans to occupy the space. Samsung Hub, which received Temporary Occupation Permit in November 2005, is on a 999-year leasehold site. The floor just transacted was sold by a partnership between the Buxani Group and offshore investors advised by Mukesh Valabhji of Seychelles-based Capital Management Group. Last year, the same partnership sold Samsung Hub’s 20th floor – which is also 13,132 sq ft in area – for $2,800 psf. It was bought by a China investor. The Buxani-Capital Management Group tie-up is now left with four of the six floors it clinched in the building from OCBC Properties in 2007 for $122.44 million or $1,560 psf. The six floors added up to 78,490 sq ft. Market watchers say the record price just achieved at Samsung Hub reflects the still strong sentiment for strata offices. CBRE’s analysis of URA Realis caveats data shows that $1.94 billion worth of such units have changed hands so far this year (the latest transaction captured was on Nov 22) – up from $1.33 billion for the whole of 2011. Roughly half or $950 million of the 2012 deals are in four new projects under construction. Leading the pack is Paya Lebar Square, with about $520 million worth of office units sold so far this year, followed by Eon Shenton ($160 million), Oxley Tower ($148 million) and PS100 ($123 million). In addition, the momentum continues to be strong for resale transactions of strata offices in completed projects such as The Adelphi near City Hall MRT Station, The Central in the Clarke Quay area, Burlington Square along Bencoolen Street, GB Building in Cecil Street and International Plaza next to Tanjong Pagar MRT Station. In psf terms, the most expensive office transaction so far this year was $5,379 psf – for a 614 sq ft third floor office unit in the 999-year leasehold Peninsula Plaza, amounting to $3.3 million. The deal took place in July. Jeremy Lake, executive director (investment properties) at CBRE, says: “The strata office market continues to remain active with strong buying interest from investors and end-users – for both existing properties and new project launches. Prices are continuing to edge upwards and I expect the segment to continue to perform well in 2013.” In June, the Buxani-Capital Management partnership completed its purchase of 51 strata offices at Parkway Centre in Marine Parade Central – and it has since resold 11 units at an average price of above $1,600 psf. It paid nearly $53.4 million or $1,043 psf for the 51 units. Parkway Centre is on a site with a balance lease term of 68 years. Over in Bencoolen Street, a Guthrie-Sun Venture tie-up which acquired 66 office units in Burlington Square from a partnership between Wing Tai and City Developments earlier this year has resold 30 of these units at $1,782-$1,893 psf. All eyes now are on Far East Organization’s upcoming launch of a new project with frontage on Robinson Road and Cecil Street. Located next to Capital Tower, the 99-year leasehold development will have offices and medical suites – primarily for sale. The project was originally named The Index but it will now be known as SBF Center, after the Singapore Business Federation, which will be a major occupier. However, it has yet to be decided whether SBF will buy the space or lease it from Far East.